Mixxx Development Blog: Mixxx 1.12 Beta Released! Don't forget to make an announcement on the facebook and google+ Mixxx pages too! May I ask if anyone comes across any new keystroke in the new beta version to drop me a mail at jamrokka@googlemail.com please please please. I use the software to mix tunes ok, but because I have no sight I use a screenreader. I depend entirely on the keyboard keys to use mixxx so any headsup would be greatly appreciated. Thanks. I was afraid you had let it languish. This is excellent. I'll celebrate with a new mix when this new version comes out. Everyone I just want to thank you for the awesome work that you guys put into this! This program just keeps getting better and better. I think its finally to a point where this is going to be my primary Dj software. Help please!!! I have Mixxx software version 1.11.0 and the "Mic" function does not work. The "Mic" button lights up but the talk button does not, nor does it respond. The software recognizes my USB mixer in preferences and allows me to select it. If at all possible, can someone get back to me by today or tomorrow with an answer? I had to postpone a talk show last weekend due to the mic function not working and would hate to have to do so again this coming weekend. Absolutely number one mixer ! It work perfectly on Mac. "le point d'entrée de procédure SetCurrentConsoleFontEx est introuvable dans la bibliothèque de liaisons dynamique KERNEL32.dll" (The procedure entry point SetCurrentConsoleFontEx could not be located in the dynamic link library: Kernel32.dll, in english), so I can't execute it. Thanks for testing E-Gwen! That is definitely not intended. We'll get that fixed ASAP and I'll drop a note here when the beta is updated. Ohhh yeaaaaaaaahh!!! we mised you! E-Gwen -- we updated the beta build and hopefully your issue is fixed. Could you please try again? Thanks for helping us make Mixxx great! I manage to use Mixxx 1.12-b1, with Asio4all 2.12 on Windows XP 32 Bits. The new interface just makes me a little lost, but I was picking up the right buttons after several seconds. It communicates with iTunes 12.1.2 folder, that's ok. I posted a message saying I managed to install MIXXX 1.12-b1 on Windows XP with your new version, but your server should have considered me as a robot. I reply several times, but nothing is published ! Absolutely fantastic! Thanks to all of the contributors for all of your dedicated and continued hard work with developing Mixxx. Keep up the great work. are there any skins for the beta? Great work, really impressed by the Key Detection engine. Thanks for all of the hard work to everyone behind creating Mixxx. Just BIG THANK YOU for your work! Great software....it will be perfect if you put an automatic button Left-Right (desk 1 & desk 2). Great work! I am using mixxx for a long time and the new version seems going to be perfect... If I had one wish, I would prefer a smaller percentage of the scalling factor for the waveform. Sometimes it would be usefull to see approx. 1min in advance for a 10min track. in entrambi i pc faccio molta fatica ad utilizzare i vinili (MixVibes2) a causa di diversi bug. peraltro non riesco a creare un account per parlarne sul forum, peccato. does this mix video as well as audio? Awesome! 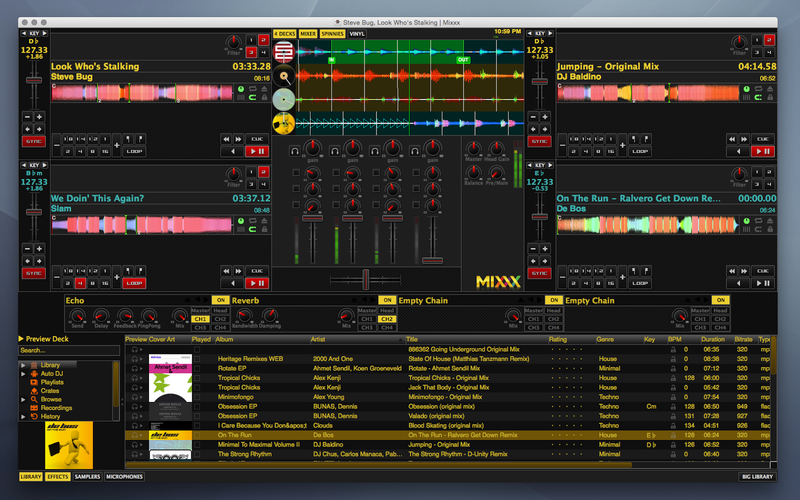 Huge fan of mixxx and this release makes it feature complete in comparison to other DJ software. So excited for all the new effects and the ability to chain! I tried out the beta and it looks like it can even do key recognition now and the resizable GUI is awesome! Things are glitchy and slow still but I'm sure it'll be smooth by the time it gets to release -- great job guys! Had tried the beta but it began to freeze up after a added more of my library. I love the look and feel. Hope it gets fixed soon. The stable version has mic issues. Did not get a chance to see if the beta had them too. Any update on final release? When I download the new version will it keep my settings such as my created crates? sorry i do not like it to hi tach for a basic users like me ,be nice if you could make a simple version just for streaming into Seacond Life with mic able and auto dj streamline version would be nice . Download site broken. Hostgator.com forbidden warning.